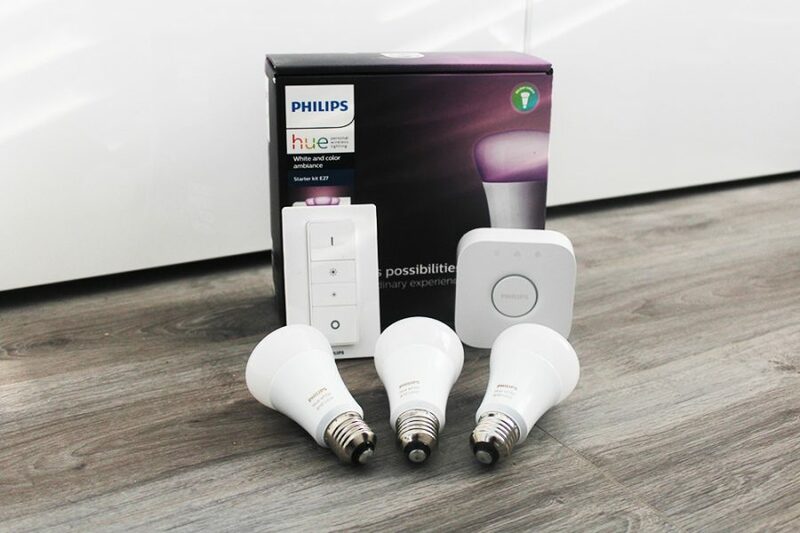 Philips are leading the way in the smart home lighting market with a range of bulbs that fit most light sockets be it a bulb or LED spot light, they have switches, dimmers and sensors, and now they have a range of ceiling lights that I designed specially for the Hue eco system. 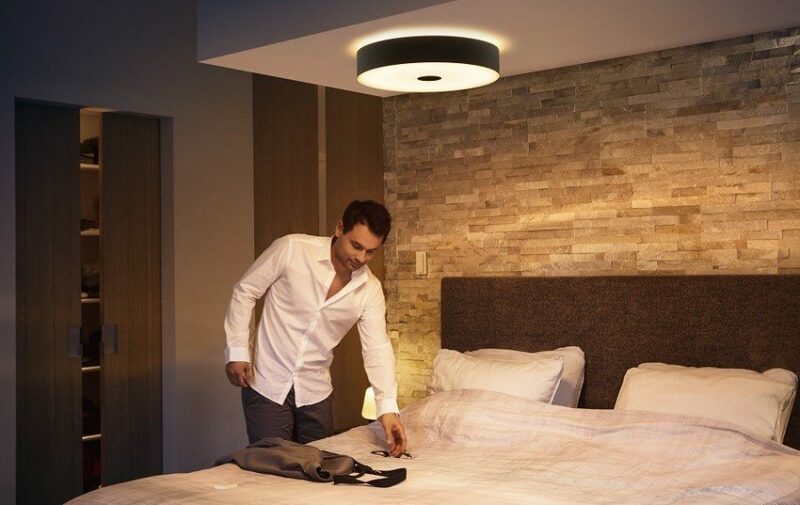 We have rounded up, review and take a look at the different Hue ceiling lights currently on the market, the clever design and how they can be used. As ceiling pendant lights go this is s stylish design that will give you all the colors you may want, the Hue Beyond ceiling light is dimmable and also allows you to select from the full spectrum of colors and not just white like the other ceiling lamps. 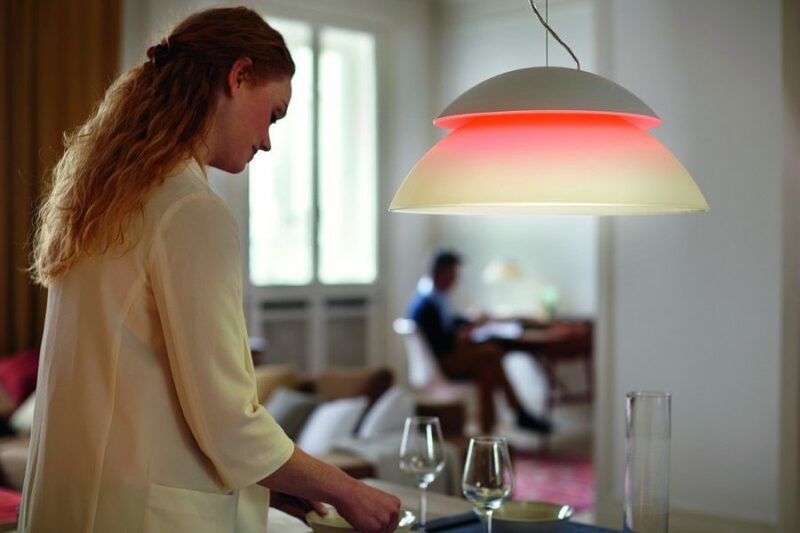 The Philips Hue Beyond has two independent light sources which means you have a uplight that can be one color, and the main downlight lamp which can be another. 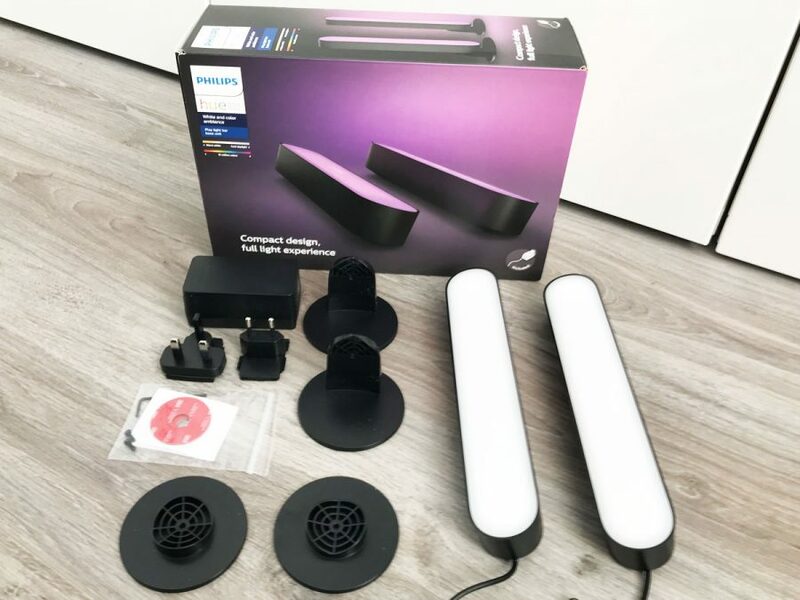 This is great for creating different mood lighting while ensuring you can still see by having the downlight for example to be brighter and whiter perhaps, or you can set them to whatever you want. 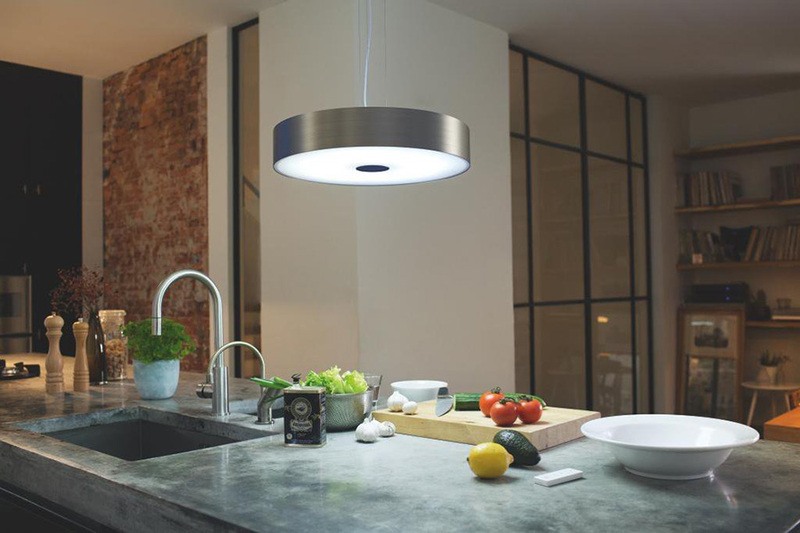 This ceiling light is great, looks stylish, ideal for your kitchen and can be set in different colors while not having just one bulb, but two giving it even more flexibility and creating even better lighting effects. A stylish sleek light that is ideal for over a dining table or breakfast bar. It shines light up and down and can be set to different colors. 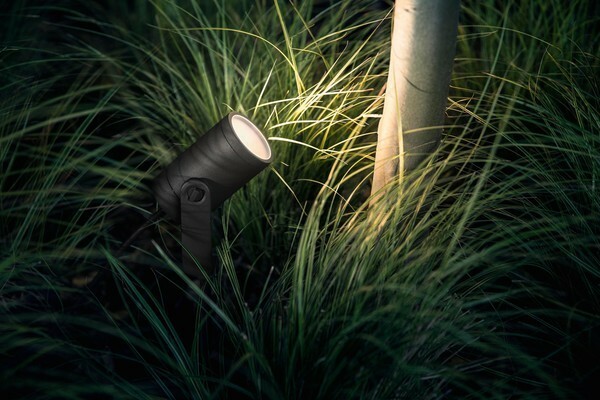 It is 129.8 cm in length with 2 x 3,000 lumens in brightness from the LED bulbs shining up and down from it. The light is hung from 2 wire cables allowing you to adjust the height the light is from the ceiling. This light will be available from September. 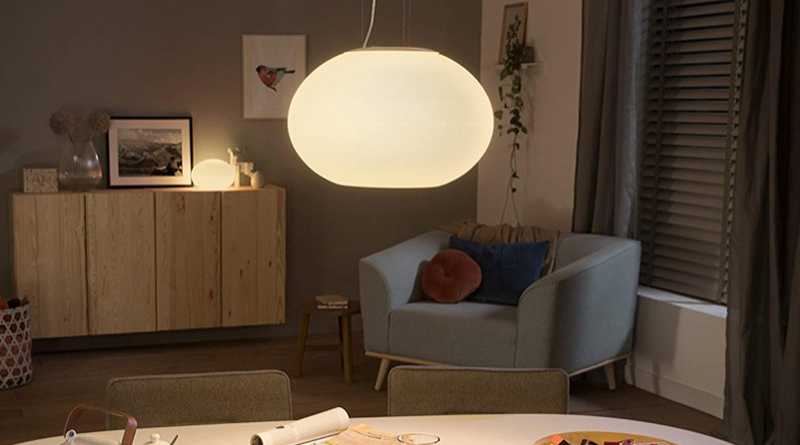 The Philips Hue Flourish is a bubble or orb like light that can be bought as a ceiling light or lamp. It is a color light so can be adjusted in color and brightness all through the Hue app. These ceiling lamps are white only, they can be adjusted from cool white to warm white however there is no color selections available. This is one of the lights we just love, it is very stylish and modern and would look great and work in many rooms. This suspended light can hang 9 feet from the ceiling and be adjusted to the height required. 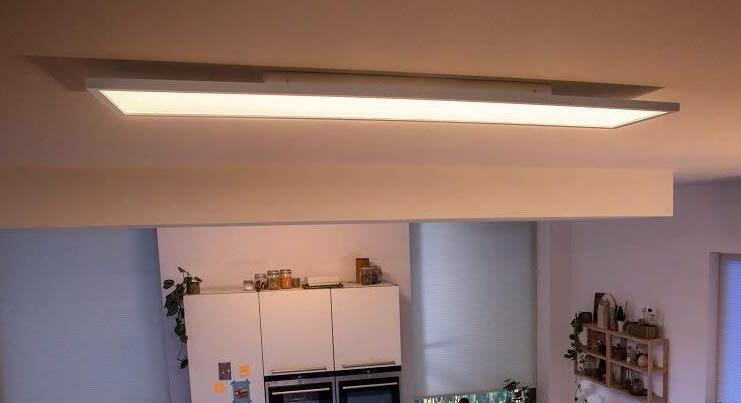 The ceiling base plater has 3 metal wires that hang down which support the light itself, these can be adjusted to the height that suits, and then there is the power cable that goes down the middle and can be clipped to the metal wires around it. This light is white only, so no colors can be set, however it can be changed to 50 thousand different shades of white depending on the setting you need. This light is ideal for bedrooms, in the kitchen over a worktop or hanging down over a dining room table. If you want a stylish light for your home that will work with Hue then this is a great choice and the perfect way to have something that is designed for Hue. This light can also be bought in black as well as the metal finish shown. 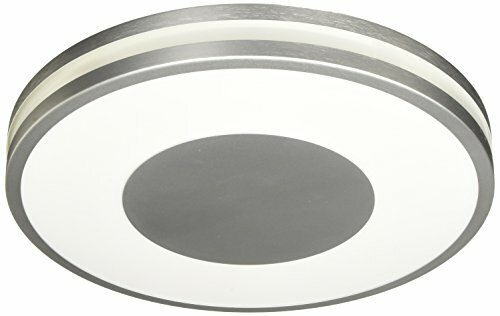 This is a simple and well designed flush mount LED light, with builtin in Hue lighting that gives off white light only. The slim design makes it ideal for porches, toilets or areas you want something that is less intrusive then perhaps the light before. 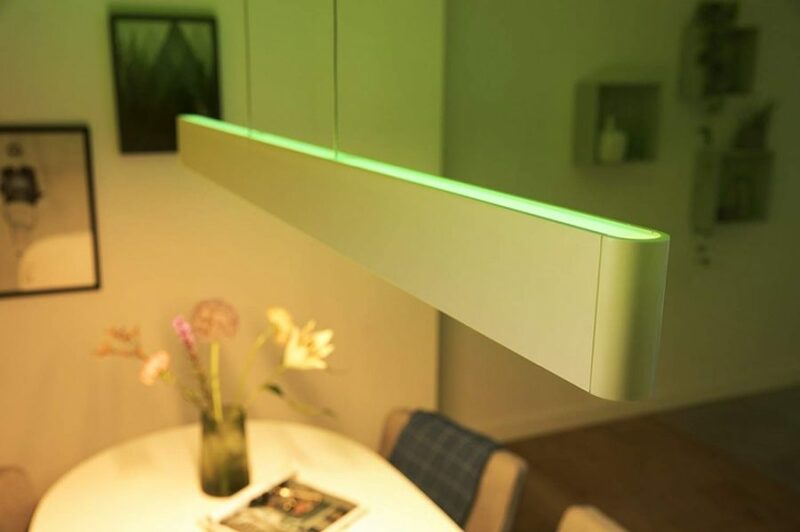 As with the other lights once connected to your Hue network it can be controlled by voice via Siri or Alexa, using your phone or the hue switches. With the design of this light it will brighten up areas below as well as giving off a nice ring effect onto your ceiling which can reflect down. 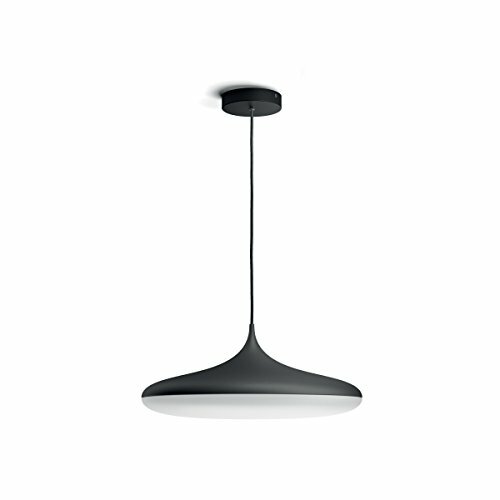 Another pendant design that can be bought in either Black or white in the UK is the Hue Cher ceiling light. A stylish design that gives off a white light and can be dimmed and adjusted to suit. A very simple design that gives a good downlight, makes it ideal for use in kitchens, dining areas and in the living room. This ceiling lamps is white light only and can be adjust from cool white to warm white. The light comes in black or white with the pendant cable and ceiling fitting being that color. The light section is a frosted white color where the light shines through. This is a really sleek looking light and perfect for a kitchen breakfast bar or worktop area just like in the image above, or perhaps above a dining room table as a great feature and a great way to set the mood. 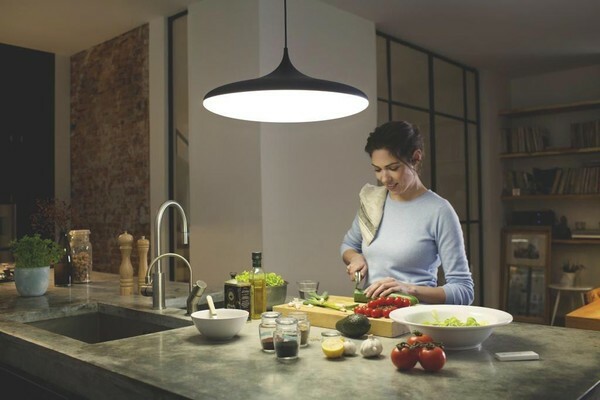 A stylish light can be bought in black or white in the UK and is very silmiler to the Philips Hue White Ambiance Being Dimmable LED Smart Flushmount in terms of style and design. 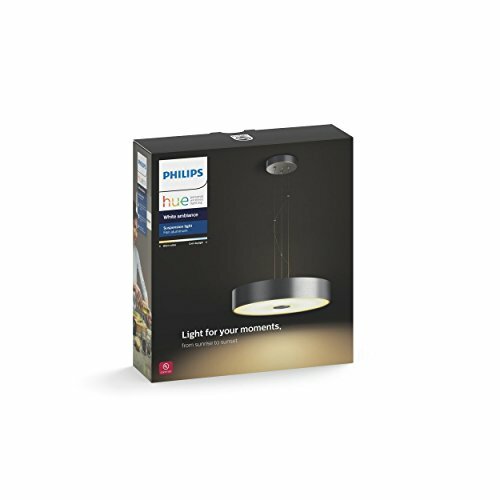 This also comes with a dimmer too, so if you have a Hue set up already you could install this in a new room and have the dimmer ready to use for it too. This would be ideal for an office or living room where you can brighten or dim the white light depending on your needs and what you are doing. 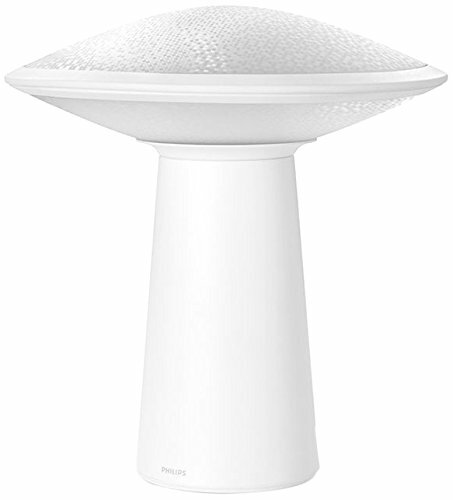 The Hue Phoenix is a little more basic in terms of style and design, it is white as opposed to metal like then other lights. This model can be wall mounted as well as ceiling mounted. So if you want a wall light or wish to replace one you already have then this would work well. Like the others this is a white light only and has the bulb built in, so there is no way to change this. 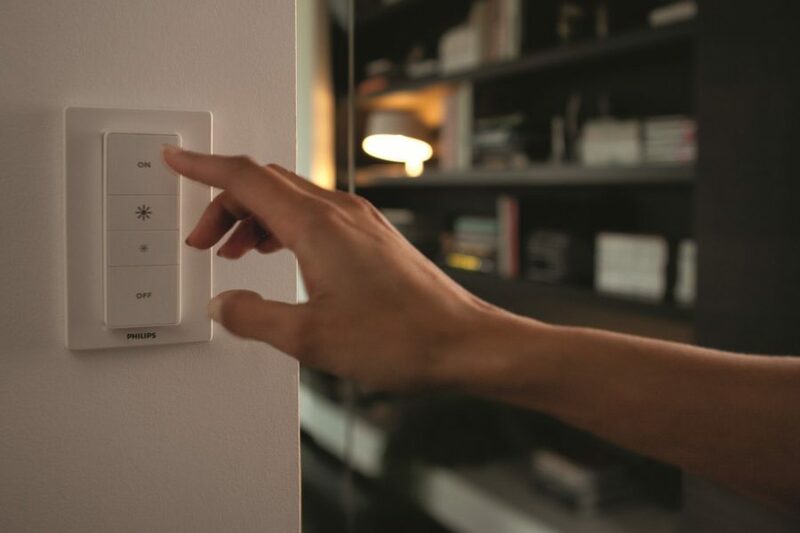 The light can be dimmed and the brightness changed via your app or the Hue dimmer switch. 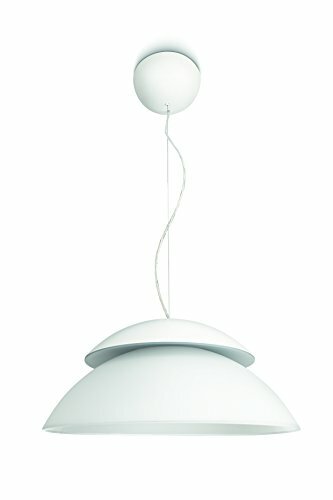 Looking like a UFO this fun hue ceiling lamp looks great and would work really well in a kitchen or above the dining room table. The height of the map can be adjusted to suit, making it lower if needed depending on your ceiling height and how you wish to use it. As with the other lights this is a white light only so no color, you do need a Hue bridge to set up and use, however once installed you can use with Alexa and Google home to voice activate the light. A flush ceiling panel light designed for work areas such as a kitchen or office where bright light is needed to help work. The panel can be bought in different shapes and sizes, there is a round option, at 40cm in diameter, then there are two square panels, 30cm by 30cm, and 60cm by 60cm. Finally as pictured is a rectangular panel at 30cm wide by 120cm in length. These lights will be available from September. These ceiling lights installed and fitted just like your traditional ceiling light that you are replacing. You will need to turn the main power of to do this and require an electrician to safely change over the light to your new Hue ceiling light. Once installed the light must be left switched on at the light switch, you can then use your Hue app to turn the lights on and off, or set up a Hue Dimmer or tap button. Just like the other lights the flush Hue lights are installed the same way, the mains lighting cable is wired into the fitting on the light. Using your own Ceiling Lights? 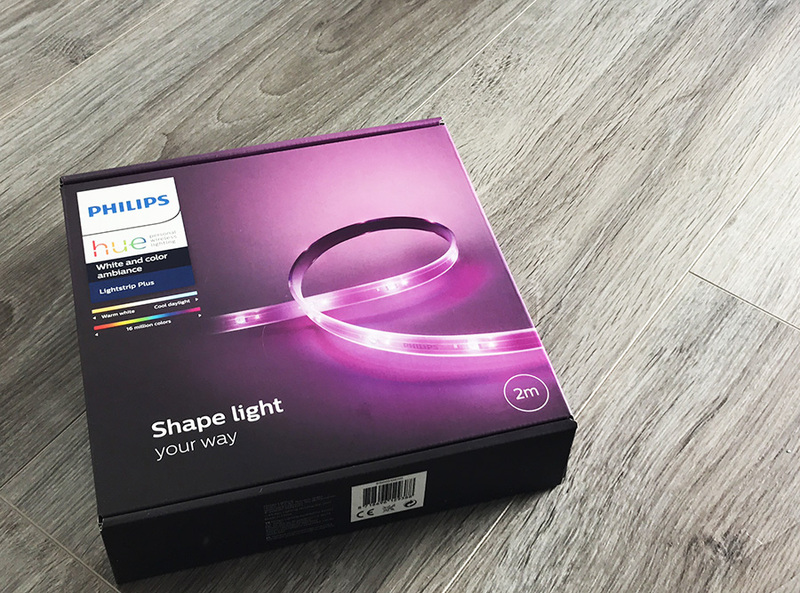 If you already have a ceiling light fitted that you love then you can just change the bulbs to Hue bulbs and it will work just like these Hue lights. There are a range of different bulbs in color and white only to suit your needs. View all the Hue bulbs here. Can you compare the brightness of these lights? I would like to know the Lumens rating if possible. 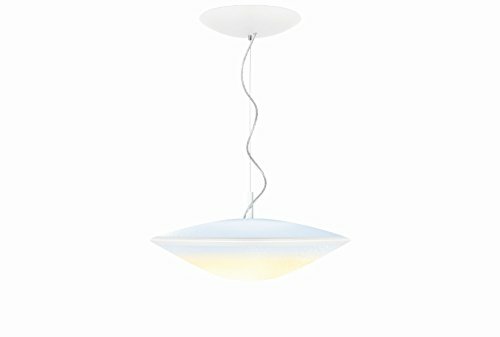 Is the beyond pendant light brighter than the flourish? Hi how many lumens do each of these lights put out? That’s a critical factor in lighting design, yet surprisingly hard to find. thanks.